You might not think it’s important to know the sizes of garage doors unless you are about to buy a new home or need to have a new garage door installed. To make sure you have the right size garage for your home it may require you to do a little homework. Our technicians have put together some things for you to consider when you are planning to have your opening widened or expanding the size of your garage. We’ll consider such things as how to measure for a new door, standard door sizes and how to change the size of the opening of an existing garage door. Not every home is made the same and every homeowner needs will vary. This means that not everyone is going to need or want the same size garage door. You can avoid the headache associated with having the wrong size garage door fitted, when you know what to look for. The process may take some time but the end result will hopefully be beneficial and useful to you and your entire family. We hope this information helps you to make a wise decision about your new garage door. Top manufacturers offer garage doors that are anywhere from 8 feet to 20 feet wide. While not many are offered in the 8 feet range, you’ll find that there are some older homes that will fit smaller cars. There are still doors to suit the needs of those homes with a smaller garage. 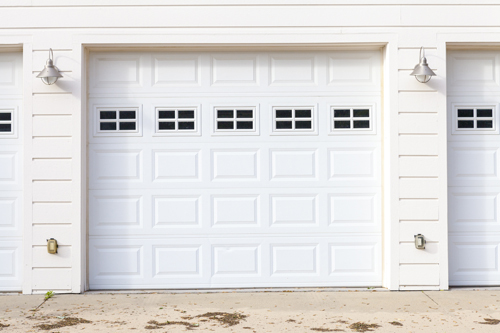 The height of most garage doors is either 7 or 8 ft. When you are having a one-door garage built for every car housed in the garage, a 9 ft. wide by 7 ft. high door may be recommended. However, if you have a larger vehicle, such as a truck, this amount of space may not be sufficient. You may need a 10 ft. wide with a height of 8 ft. Discuss this with a technician to ensure your garage opening is wide enough to accommodate all of your vehicles. When planning to have a new garage built, you will also need to consider if you want it to be attached to your house. Attached garages are the most popular now-a-days with new construction. It is often easier to minimize the opening of an area, such as a garage. When a homeowner needs to increase the size of the opening, it is a little more challenging. This is generally done when someone has purchased a vehicle that will not fit into a standard garage opening. The size of the garage, itself, generally has to be increased in order to increase the opening. The largest challenge is typically the amount of headroom over the current door opening. The header above the opening will need to be rebuilt. Without adequate space above the opening, the roof of the garage may need to be raised. When this is done, the technician will also need to consider leaving room for the garage door opener to be installed. Consider also the depth and width once the opening has been expanded. You may realize that while you may be able to park the vehicle in the garage, you don’t have much room for anything else, like storing items inside your garage and freely moving about. Sometimes, given all of the complications that can be experienced by simply trying to enlarge an existing structure, it may be more beneficial to simply have another garage built, from the ground up. When considering this as an option, it is important that you count the cost of rebuilding versus enlarging your existing structure. This might help you make a clear decision as to how to proceed with your garage door expansion.